A few years ago a radical change took place in Reto Scheiber’s life through an encounter with Jesus Christ. This event had such an impact on his life, that he turned it into an artwork for his MFA at Central Saint Martins College of Art and Design in London, England. This work, a three part installation, consists of two murals to the right and left of a light box, which is placed in the middle. The installation represents God the Father, his Son Jesus Christ and the Holy Spirit in a non-figurative, highly abstract way. The Trinity is subtly reduced to the essential. Scheiber does so through an abstract language deriving from examples like Donald Judd, Mark Rothko, Sol LeWitt and Barnett Newman, whose work Reto Scheiber has carefully studied. The influence of minimalistic elements of the 60’s is clearly visible here. Scheiber symbolically represents the Father as a quadrangular black box with a light inside. The light box indicates that God is light and that there is no trace of darkness in him (1 John 1:5). The mural to the right depicts Jesus by means of a black border around a white space in the middle. The Holy Spirit is portrayed by two vertical black beams on a white background to left of the light box. 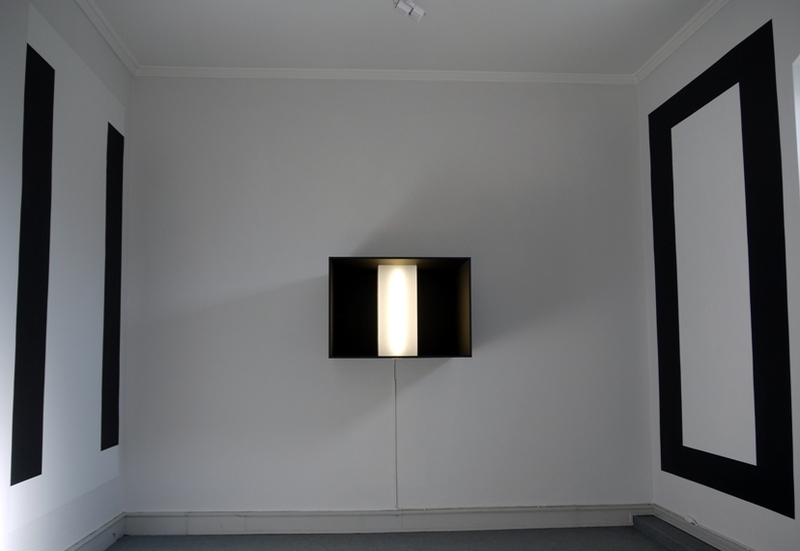 The installation is placed in a dimly lit room that is painted light grey. Although this work still needs to find a permanent home, it seems predestined for a chapel or a place of prayer, as the installation invites the viewer to meditate. Only with effort can one break away from the rich meaning of the work as one contemplates it. The video installation Jesus is a further development of The Godhead installation. This video does not make use of any well known representations of Christ: no crosses, Christ figures or Stations of the Cross. Also this work employs the reduced language of minimalism. In vain one waits for narratives of Jesus’ life. When one has seen the space-light installation The Godhead, one remembers the glass cube in the middle, which is being lighted by a untouchable source of light. This cube, which the artist has photographed several hundred times and assembled into a video film, seemingly is the only object in the video. The strict cut of video sequences and the rhythm of the minimalistic sounds increase the force of the video, resulting in a rich density of impressions from which one can only barely withdraw oneself. Inevitably the viewer is drawn into the battle between light and darkness. Reto Scheiber: The Godhead, Installation – Space and Light, light box, 60 x 85 x 85cm, Emulsion on MDF, two murals of 250 x 150 cm, London 2007/Galerie ASPEKT, Neustadt, Germany 2012. Reto Scheiber: Jesus, video installation, 2007. Johannes Manzis a sculptor. He founded and manages Galerie ASPEKT, Maximilianstraße 18, 67433 Neustadt, Germany. The gallery boasts a number of spacious rooms and a cellar in an old winery. While broadly focusing on the work of artists of Christian faith, Galerie ASPEKT is also rooted in its community and committed to encouraging the work of local artists. This has led to mutual respect and dialogue. Recently Manz was asked by the town council for advise regarding plans for a city park in which several art works will be placed. www.aspektgalerie.com, also on Twitter and Facebook.